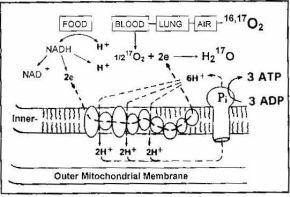 Most of the energy needed for all life processes is produced by mitochondria, cell organelles called “the power plants of living bodies.” There, the fuel, hydrogen ions provided by food metabolism, is “burnt” in the presence of oxygen, provided by respiration of surrounding air. This reaction, which results in formation of water, yields a large amount of free energy that, in turn, is stored in the form of ATP (adenosine triphosphate). Highly complex enzymatic processes regulate metabolic water and ATP formation. These oxidative phosphorylation (OXPHOS) reactions are strongly coupled. 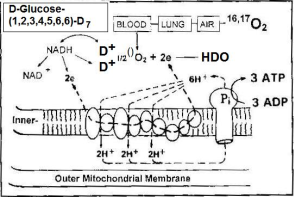 The coupling and, implicitly, the rate of mitochondrial metabolism, depends not only on the need of energy, but also on a number of normal and pathological conditions ( e.g., pressure, temperature, drug administration and disease). Of the latter, degenerative diseases such as Alzheimer and Parkinson, as well as aging, are associated with mitochondrial DNA mutations which lead to defects in the structure and function of the mitochondrial enzymes. 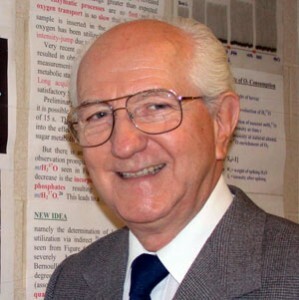 Professor Mateescu’s group is pioneering a new bioanalytical method for in vivo studies of mitochondrial metabolism, namely concerted 17O/31P MRI and MRS (MR imaging and spectroscopy). Research projects include systematic studies of the effects of various agents on the OXPHOS in carefully selected animal models. The ultimate goal is to establish a powerful tool for monitoring drug poisoning, diseases, and their treatment. Potential and Limitations of Oxygen-17 MR Perfusion Measurements presented at the ISMRM Workshop on Cerebral Perfusion, March 2004, Venice, Italy. The interaction of water monomers, trapped in hydrophobic solvent cages, with a wide variety of molecules can be characterized in considerable detail by means of high resolution 170 NMR and vibrational spectroscopy. Recently, a most remarkable differentiation between the reactivity of water monomers and bulk water was experimentally discovered. Molecular species at liquid-liquid interfaces can also be characterized. This new avenue will contribute to the understanding of the role of water in life processes and a better understanding of the chemical basis of MR imaging. Isolation and characterization of species of fundamental importance in chemistry, such as OH–, OD– and isotopomers of H30+ and H4O2+ constitute fascinating projects. During his/her research the student will gain a thorough theoretical and experimental knowledge of NMR (including 2D NMR). Book: 2D NMR: Density Matrix and Product Operator Treatment. Prentice Hall, NJ, 1993, 195 pages. Functional Oxygen-17 Magnetic Resonance Imaging and Localized Spectroscopy, Adv. Exp. Med. Biol. 2003;510:213-218. Mitochondria and NMR: New Insights at High Fields, ENC (Experimental NMR Conference) 30. 104a, 2002. 17O and 31P Magnetic Resonance Imaging and Spectroscopy: In vivo Investigations of Cell Bioenergetics, Spatially Resolved Magnetic Resonance, P. Blumler, B. Blumich, R. Botto, E. Fukushima (Eds. ), Wiley-VCH, 1998, 421-429. Concerted 17O/31P Magnetic Resonance Spectroscopy: A Novel Approach for in vivo Correlation of Oxygen Consumption and Phosphate Metabolism. Adv. Exp. Biol., 1994, 361, 234. From Materials Testing to Brain Function Testing. Spectroscopy International, 1991, 3, 14-18. Water, Ions and O-17 Magnetic Resonance Imaging. In Water and Ions in Biological Systems. Lauger, Packer and Vasilescu, Eds; Birkhauser: Basel-Boston, 1988, 239-250.